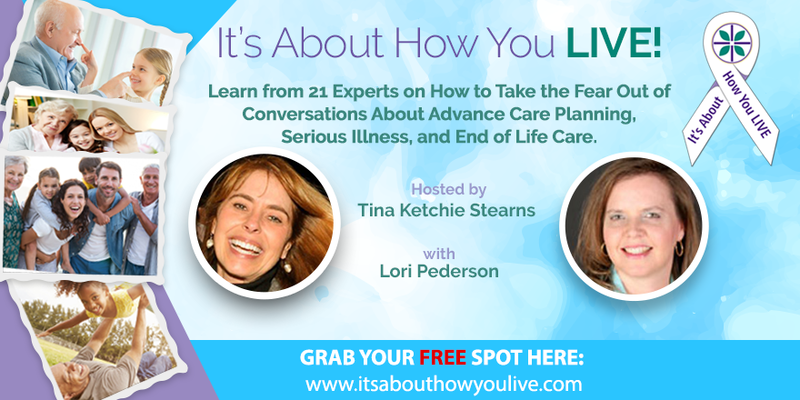 It’s About How You LIVE – Taking The Fear Out Of Conversations About Advance Care Planning, Serious Illness and End of Life Care. My interview will air on Tuesday, October 3. If you are a medical professional, a care giver, someone who has a serious illness, someone grieving a loss, or if you are simply interested in learning more about these topics, this telesummit is for YOU! If you don’t like to talk, or even think, about some of these topics, if you struggle getting your loved ones to talk about these topics, or if you are ready to take the fear out of discussing these important topics, this telesummit is for YOU! I am excited to share my interview with you, as well as the other 20 interviews from this distinguished group of experts. Register today, and share this with your family and friends as well. We want everyone to have the opportunity to listen and learn from this amazing group because… It’s About How You LIVE! Advance Care Planning, Serious Illness and End of Life Care. Each of the 21 experts are passionate about their field, and after hearing their interviews, you will walk away amazed at the amount of valuable information you learned. This is a unique opportunity to learn from the best of the best, so please be sure to take advantage of this free event by registering today. Just Click here to register now! All the best to you! See you at the telesummit! Click here to register. My interview will air on October 3! As part of National Hospice/Palliative Care Month we would like to encourage you to share your stories on how your local hospice provided compassionate care to a terminally ill loved one and/or grief support to you, your family and friends. When my mother was terminally ill, our local hospice in North Hollywood, CA provided us with caring individuals that assisted my mom with daily routines. Bernadette was one of the most compassionate and loving individuals I have ever met. She handled my mom like she was her own mother. What an amazing gift this woman had to be able to express such pure love for a person she barely knew. The individuals that dedicate themselves to helping the terminally ill and their families rarely receive the recognition and appreciation they deserve. Families are so overwhelmed with grief that it is not until the grief has lifted that they can truly appreciate the amazing work these individuals do every day. For all of you that are dedicated to service through Hospice, I thank you for your amazing ability to show compassion and love every day. Your gift is truly priceless. We invite you to Share Your Story in the Comment Section below or on our Facebook page.